* Marinate the wings with the minty honey marinade sauce for 1 hour. Using a bamboo skewer or satay stick pierce it through the length of the wing so that it helps to straighten the wing as shown in the picture below. Placed the wings on the baking sheet . Baked at 200 deg C for 35-40 minutes, turning the wings at every 15 minutes interval for even baking. When it is golden brown , take it out of the oven and served it with chilled beer or red wine. 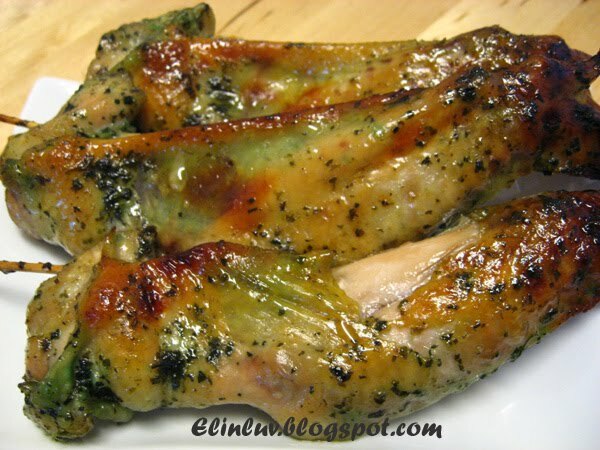 Delicious minty honey roast wings that is a keeper for sure. 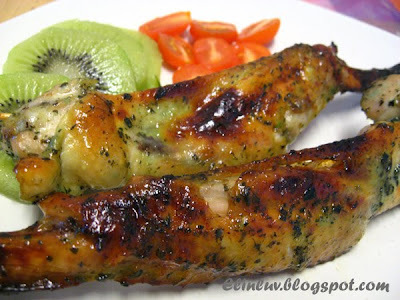 mouth-watering pieces of roast wings to delight wings lovers....you are one ? I tucked them in LOL! 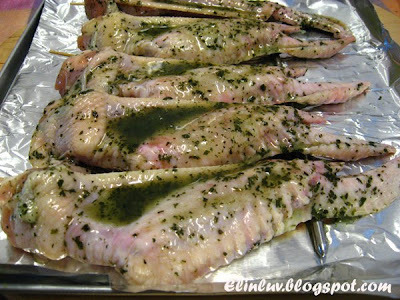 1.Marinate the wings with the minty honey marinade sauce for 1 hour. 2.Using a bamboo skewer or satay stick, pierce it through the length of the wings so that it helps to straighten the wings as shown in the picture below. 3.Placed the wings on the baking sheet . Baked at 200 deg C for 35-40 minutes, turning the wings at every 15 minutes interval for even baking. 4.When it is golden brown , take it out of the oven and served it with chilled beer or red wine. Wow, looks so yummy and so original! Can count on you to whip up great meals! I love this creative sauce for chicken wings. I would never have thought of mint, but it sounds refreshing and delicious! I like chicken wings prepared almost in any way with any kind of the sauce. This one looks very special and delicious! I also love chicken wings too! Love the way you prepared this wings..very nice. Like the unique mint flavor of the chicken. Look at the grill mark and the light green color on the wings, I can literally feel the minty and roasty taste! 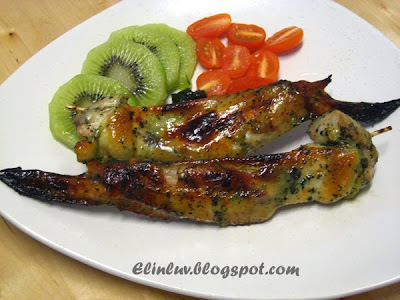 What a great idea to use mint sauce in the marinade! I'm going to have to try that. another one of your originalities? :p too bad i miss it! Oh yes! It must be fragrant with mint flavor. Oh.. I think this mint sauce is nice! I've not try marinate chicken with it yet but I think I will try it soon. Thanks for your inspiration! 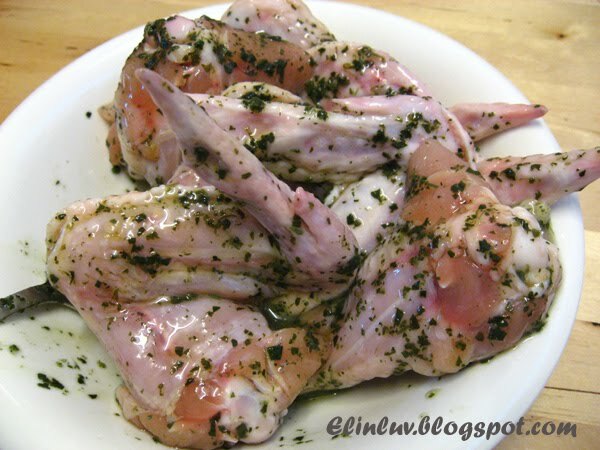 Beautiful chicken wings. I can imagine the lovely flavour with the mint sauce. I've never seen that sauce. Where did you get it like any grocery store? Wanna try it! Those chicken wongs look fantastic. They reminded me of street food in Asia and they tasted super! What a great idea! Looks so tasty! I love having mint sauce in my food too especially in my lamb chop! 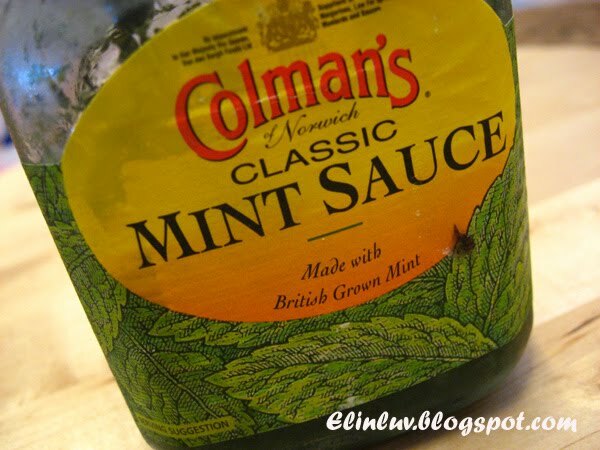 I make my own mint sauce! Your chicken wings look really delicious. Hope I can grab a few over. haha... Enjoy! Honey and mint...sounds really good! Will have to try this the next time we grill some wings. Hey Elin! This is such a great easy recipe.. perfect for a picnic or when you just want to make something easy! The final product looks amazing! They look so moist and flavorful with a nice crunchy skin. 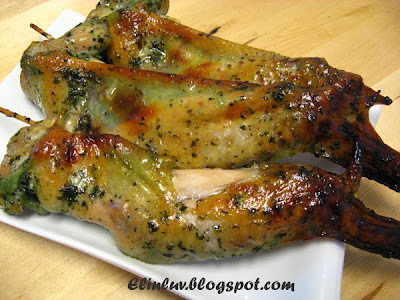 Who can resist chicken wings especially with mint? Elin, you are making me hungry again. LOL! 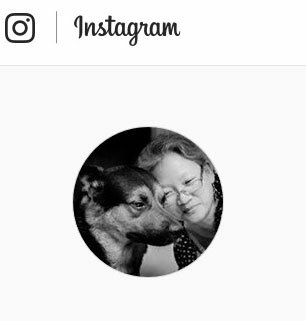 Hi , I would like to thank of you here who have left me such sweet and encouraging comments. This minty honey marinade has so far been the best for any roast.